There's something tactile and useful about creating a physical scale model for your set design -- pictured here is one of set designer Douglas Rogers' design models for a production of "Othello.". Even in today’s world of dazzling computer graphics, apps, and high-end 3D design possibilities, there’s still something tactile and useful about creating a physical scale model for your set design, and it’s the surest way to provide a strong visual sense of what your set design will look like in real life. A good scenic design scale model is a way to get a feel for the way the space looks and to previsualize the ways the performers will potentially move about within the space as the plot demands. A great model also provides the scenic designer with the chance to test out the physicality and logistics of the space from a godlike “big picture” perspective, providing the chance to play with creative opportunities while also working out the kinks. Create your potential design concept after carefully analyzing the script, researching appropriate historical styles and periods, and brainstorming creative ways to interpret the show's themes in visual ways. Put these ideas down in sketches and even collages for display and discussion in meetings with the director, other designers on the show, and your head theater tech personnel. Be sure to clearly note relevant historical periods (whether original or in a new interpretation of a classic work), and discuss visual interpretations ahead of time with the director, costume designer, and lighting designer. When presenting your vision for scenic design, note prominent colors, textures, or other elements, as these will affect everything from directing and blocking, to stage lighting, and costume choices. Tweak your approaches after feedback, then formally draft your semifinal design concept. Make sure you have all of the technical information you'll need on the space and dimensions for which you're designing. Next, you'll need to create a theater model box of your space, if you don't already have one. The standard for your theater model box, as well as for your ensuing models, should be 1:24, or a quarter inch for each foot. If you’re more comfortable with larger dimensions, you can also go with one-half inch for each foot (1:12 scale). 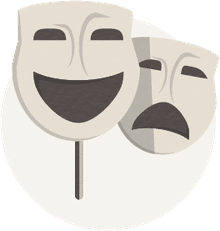 When creating your theater model box, don’t forget to create accurate scale renditions of your space’s drapes, curtains, borders, and tabs, either using the material, cardstock, or material backed by cardstock. When you’re done with your theater model box, paint the entire thing black, using a soft matte black paint. Now when you create your scale model and add those elements into the model box space, these elements will disappear to the eye, just as they do in real life. Before creating the final scale model of your set, it’s often helpful to create a more basic “sketch model” version that allows you to try out your dimensions and rough ideas in 3D before you move on to the final version. This version is also sometimes called the “White Model” as it’s unadorned and more about initial ‘big picture’ elements. You may decide to make more than one -- it’s not unusual for designers to work up more than one sketch model when planning out a potential design in order to address potential look of your particular show, and they’re also highly useful for early review with the show’s director as you plan to accommodate the story’s specific element and blocking needs. Using the same dimensions as those you chose for your theater box (either 1/2 or 1/4 per foot), sketch and cut the set dimensions and major elements using simple card stock and tape, and use high contrast colors (or even just black and white) for foreground and background stage elements. Sketch out additional elements in pen, pencil or white marker. Once you’ve finalized your notes from your meeting with the director of the sketch model, it’s time to create the formal scale model. When it comes to this part of your model creation process, it’s important to consider which materials and construction elements will work for you. When it comes to your model’s main structure, many designers use Foam Board (or Foamcore), while others prefer Gator Board. Gator Board can be a formidable advantage, as it’s very hardy and sturdy. It's much harder than foamcore and is very durable. It's especially good for working with wet clays, paints or other materials that need time to dry. However, Gator Board isn't acid-free, so it won't last forever -- an important aspect to keep in mind if you ever display your models publicly. On the other hand, while Foamcore isn’t as tough as Gator Board, it’s available in acid-free varieties -- important if you exhibit your work -- and easier to work with in general than Gator Board. It's also far easier to cut (especially if you’re using standard X-Acto knives). Continuing with the scale dimensions you decided upon originally, use your blueprint, elevations and other technical documents as a reference in order to carefully sketch and cut each of the major scenic design elements that will go into your model space. Use glue to create portable, movable components only -- don't permanently affix anything into the model itself or to one another. Refine your model with paint, pencils, and textiles. Don’t forget to be as accurate as possible to your final vision when it comes to your colors, details, and textures! 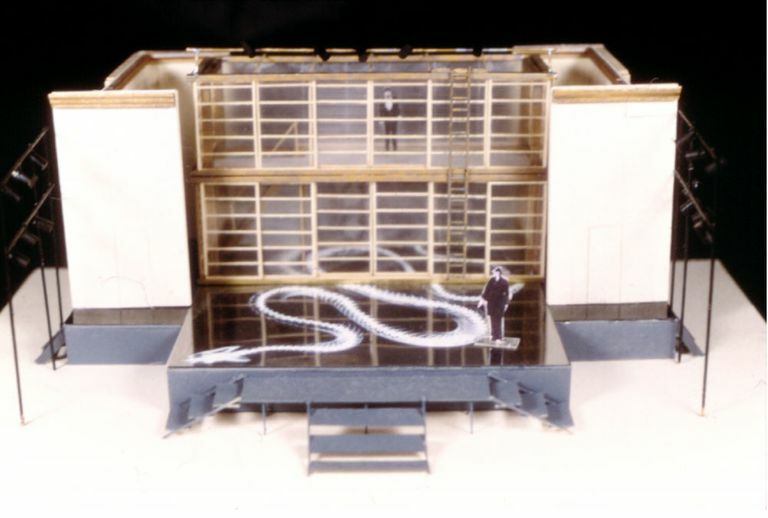 The more realistic your scale model is, and the more it reflects your final vision for production, the more useful it will be to everyone from your scenic builders and painters, to creative personnel like your lighting designer, who will often use or reference your scale model closely when coming up with the show’s lighting design and testing specific placements and combinations. As you ‘dress’ your model with final touches including major furnishings and scenic elements, remember again to keep these specific to your vision. A chair is not a chair just as a Mid-Century modern Franklin Chair is not a French Bergère. Luckily, you can find many inexpensive options for wonderful scale furnishings from miniature suppliers, model railroad, and dollhouse suppliers, as well as even from model kits. You can also sometimes purchase 3D-printed elements from online creatives who do so using 3D printers. Some high-end film production designers and Broadway scenic designers, such as Kacie Hultgren, actually use a 3D printer like the MakerBot to print custom 3D printed elements for their scale models. Don’t forget the people! Include appropriately scaled figures in your final scale model. You can create these from Foamcore, cardstock, or simply use plain 1:24 or 1:12 wooden models or mannequins. When complete, your scenic design scale model should be a tiny work of art, providing a visual and working representation of how your set for the show will look, function, and interpret the themes at the heart of the story. And don't forget to save it! Take good care of your scale model and store it carefully. You never know when it will prove useful to you in the future, whether for the exhibit, inspiration, or as a direct reference for revivals, restagings, national tours, and more.